If you are facing any problems with your piping system, turn to Nu Flow St. Louis for dependable results. As a leading company in trenchless pipe repairs, our experience and knowledge make us qualified to rehabilitate your pipelines no matter how severe the damage may be. We are proud to offer our customers contemporary solutions that are more efficient and safe than past methods of repairs. We have invested in trenchless technology, and this allows us to be proactive in repairing your pipes by wasting no time digging trenches of breaking through the walls and floors to reach the pipes in question. Now, our non-invasive solutions require minimum labor crews and equipment to be effective. When you call Nu Flow St. Louis for our services, we will first conduct a sewer camera inspection to determine what the source of the problem is. This allows our prices to be accurate and ensure that our work only addresses the problems that need to be fixed immediately. Once this diagnosis has been made and we have discussed the ideal solution, we clean the pipes with hydro jetting equipment. This cleaning process is trenchless, relying on a water tank, hose, and nozzle to provide a comprehensive cleaning. The hose ejects high-powered blasts of water to eliminate obstructions, grease deposits, and other debris within the pipeline. The water doesn’t contain any chemicals, making it much safer to use than chemical cleaners which can corrode the pipes over time. The hose ejects high-powered blasts of water to eliminate obstructions, grease deposits, and other debris within the pipeline. After the pipe has been completely cleaned, our technicians will insert a felt liner saturated with epoxy resin into the pipe. The liner is specifically suited for the size and diameter of the pipeline that needs to be fixed so that, when it is inflated, it can fully expand to the shape of the damaged pipe. This expansion allows the epoxy resin to be transferred from the liner to the interior of the pipe, and after curing for a few hours, the liner will be removed and the new pipe will be ready for usage. This new, epoxy-based pipe will be stronger than the old one and extend the life of your system by 50 years. 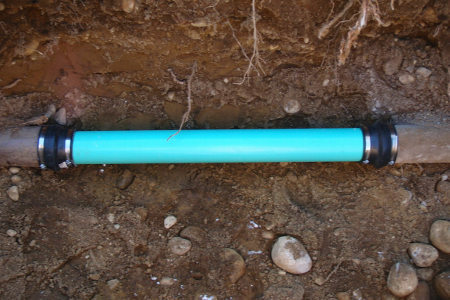 It will also be less likely to ever get a clog again since it is seamless without any joints or materials for debris to catch on.With trenchless pipe repairs, the water services to your home or business don’t need to be shut off for long periods of time, and you won’t need to relocate during our job. Within a single day, the problem is eliminated and you can resume your regular routine. Trenchless pipe lining is the best way to repair cracked or damaged pipes since it is so versatile, does not require digging, and can be completed in just one day. It is also more cost-effective than traditional methods and is flexible to suit your personalized needs. At Nu Flow St. Louis, we are the prime authority for all things pipe lining and guarantee it will be done flawlessly the first time around. Call today!